Close your eyes and think of a heavenly retreat. For some, the Grove Park Inn in Asheville may come to mind. 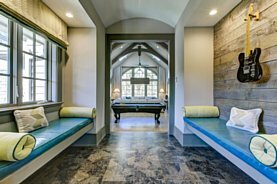 For many recent Triangle Parade of Homes attendees, that luxurious landmark is a fitting comparison for Bost Custom Homes’ newest showcase house – The Lodge at Avalaire. 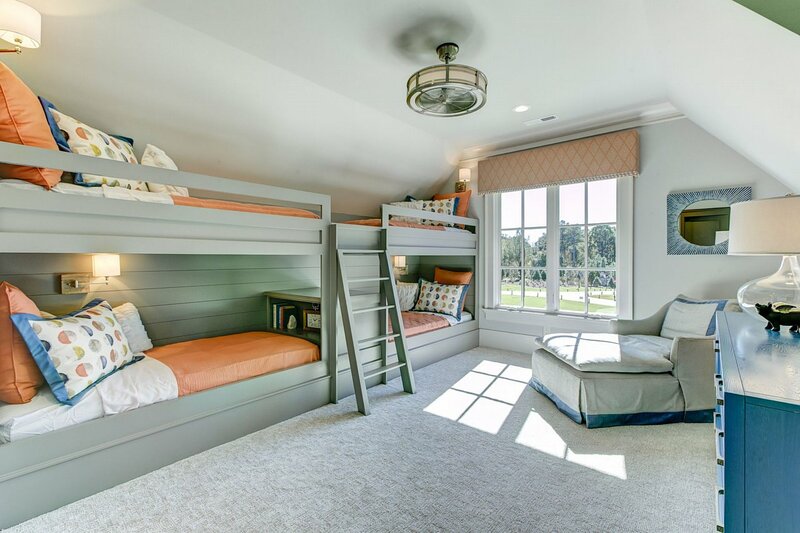 Rex Bost and his multi-disciplinary team built the imposing 6,800-plus square-foot High Country Craftsman home to showcase and introduce the latest technology and design techniques to the Triangle region. “Every area of The Lodge is stepped up from a traditional build,” Evan Bost says. 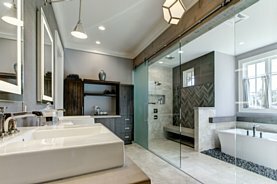 “From new products and techniques to healthy building features.” One of the home’s most technologically exciting and efficient features is lighting, which enhances every nook and cranny of this home. “We are proud The Lodge is one hundred percent LED illuminated,” Bost says, including a one-of-a-kind lighted wine cellar floor. 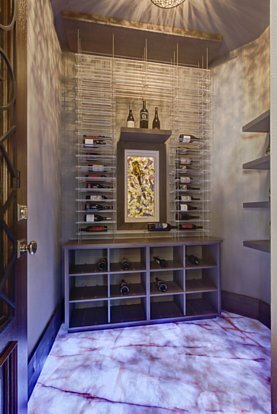 The quartzite stone floor from Absolute Stone is backlit with remote-controlled LED rope lighting that is color adjustable. 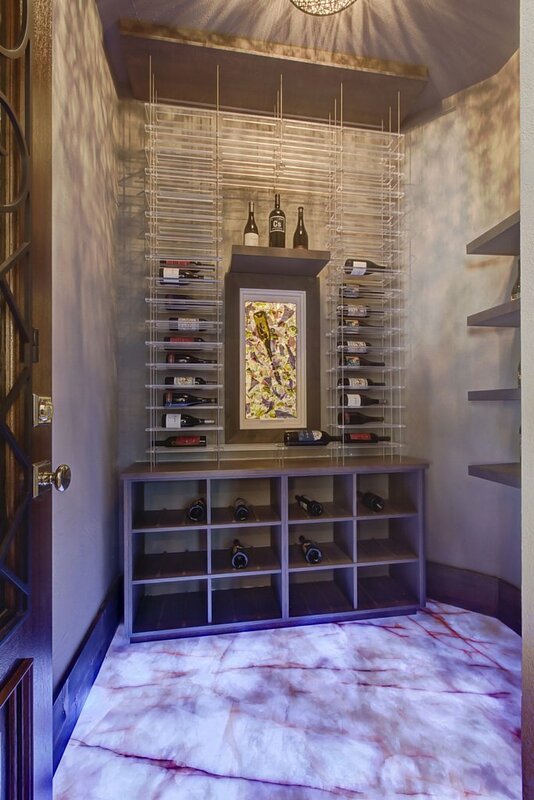 Exotic lighting patterns shine through the floor in the wine room, as well as throughout the master bathroom, underneath the treads of the main staircase, and outside around the raised pool ledge. From twinkling pinpoints of light to glowing strips, the capabilities of LED technology enhance the architectural features of The Lodge. 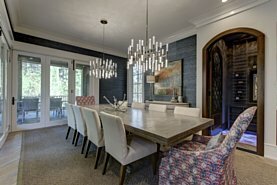 “The decorative hanging light fixtures on the main floor were carefully chosen to be unique but still relate, a challenge since many rooms are visible at once by standing in a central location,” interior designer Donna Davis of Design Works Studio says. 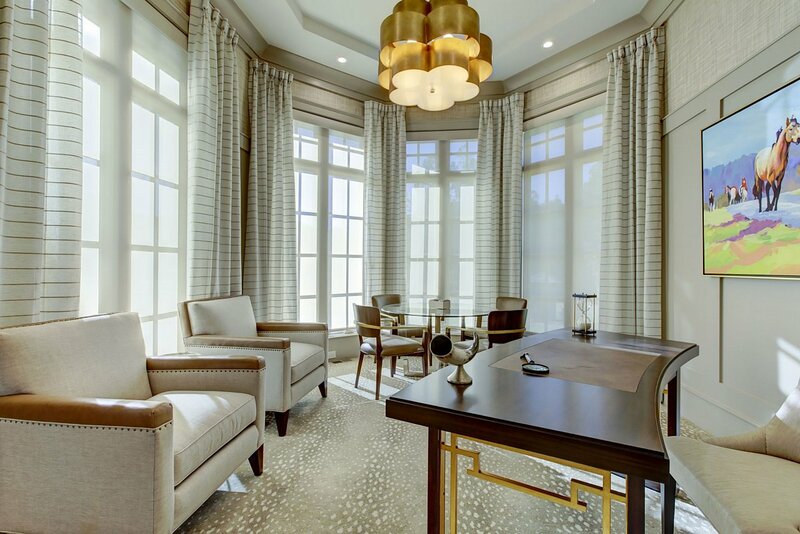 The striking, expansive fixtures also provide another opportunity to mix metals throughout the home. LED lighting is not always necessary, though, as the home has eight skylights and five sun tunnels to capture, concentrate, and bring in natural lighting. Four of the skylights with motorized shades are in the great room, snuggled between the massive wooden trusses that decorate the ceiling. Remote controlled and automated motorized shading covering the two-story windows in the theater/game room add another eco-friendly element to the lighting mix. And thirty-six solar panels on top of the covered lounge area by the pool and cabana bathhouse power, on average, forty percent of the house. The Lodge’s technological savvy is not limited to lighting, however, as the entire home is powered by a custom Control4 home automation system from Audio Advice that automates control of lighting, window shades, whole-home audio and video, temperature, security system, and a baby grand piano integrated with the audio system. 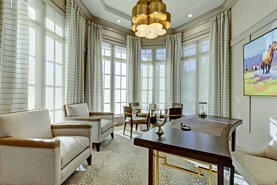 Some rooms have special technology features, such as the master closet, where two recessed luggage hatches in the floor – one remotely controlled and motorized and the other operable via assistive springs – safely tuck away empty suitcases between trips. Motorized wardrobe elevators store off-season clothing high above the prime closet real estate and can be lowered to a reachable height as needed at the press of a button. A new product, folding panel glass doors that clasp together at a ninety-degree corner, can be pushed back to completely open the dining room to a covered veranda featuring an outdoor dining table and outdoor kitchen surrounded by retractable phantom screens. High-performance features on the outside make the property run more sustainably. A 3,500-gallon rainwater harvesting system collects rainwater runoff from the gutters and yard and filters it for irrigation use. Spray foam insulation and sealed attic and crawl spaces create a tight and continuous barrier around the home’s perimeter. 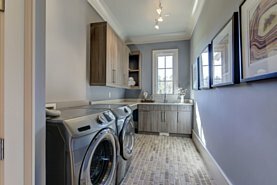 Energy Star® certified appliances and heating/cooling system along with a whole-house dehumidifier optimizes the house’s environment at all times, and argon-filled insulated windows ensure that environment is maintained. 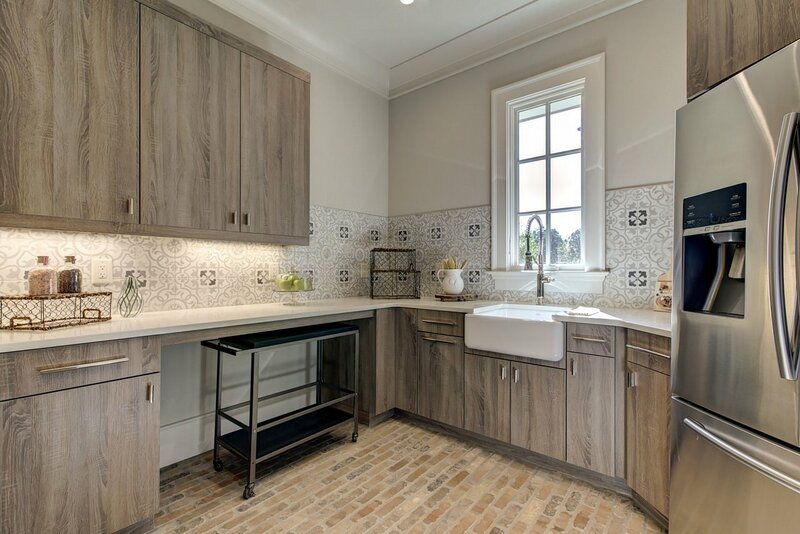 A whole house reverse osmosis system purifies all water used in the home, and no-VOC and no-formaldehyde paint and cabinetry further increase health and sustainability. The Lodge is an Energy Star® Certified Home and a Bronze Certified National Green Building Standard Home. With all of these technology features throughout the house, Bost Custom Homes turned to designer Donna Davis to integrate the technology into a beautiful, comfortable, and livable atmosphere. 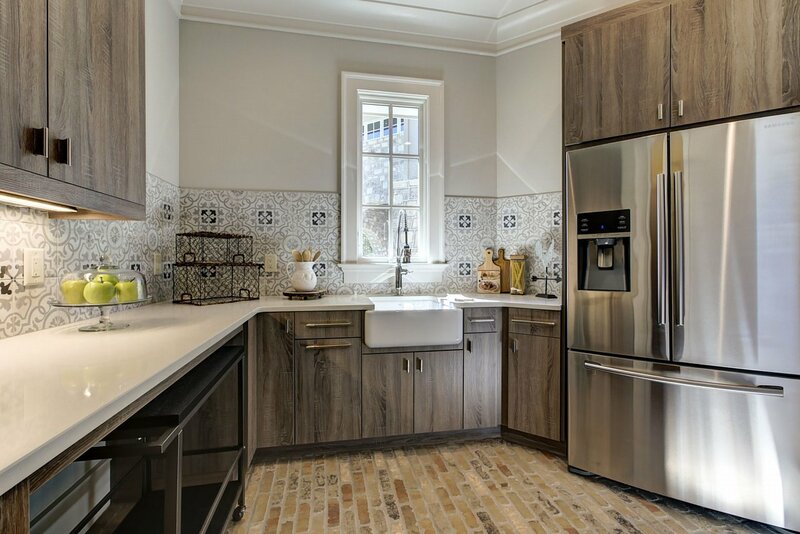 She focused on bringing in lots of materials and textures, continuing the tech theme by showcasing the latest materials like the bar’s glass herringbone backsplash tile from Triangle Tile & Stone, a way to integrate an organic feel with its silver and slate blue metallic wood grain pattern. 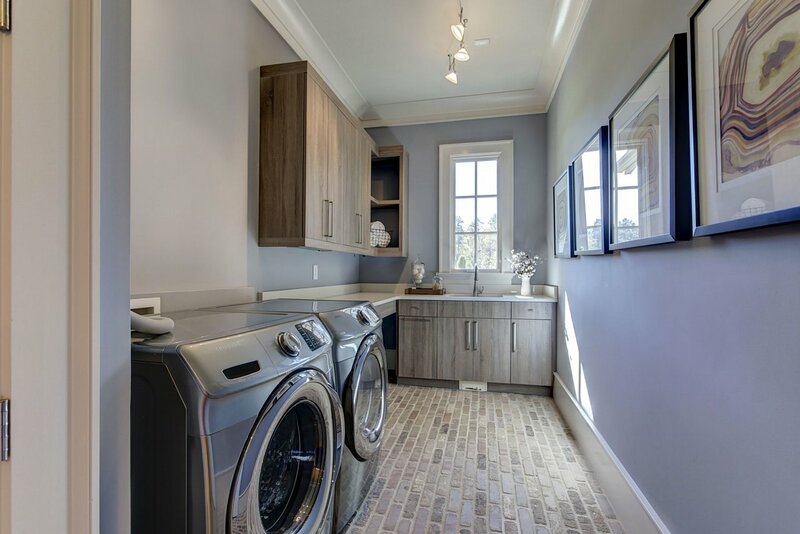 The Lodge at Avalaire features scores of personalized touches that complement the latest technology sprinkled liberally throughout every room, nestled in the last remaining planned luxury community in the northern Raleigh area. The result is a showcase masterpiece that anyone would be proud to call home.